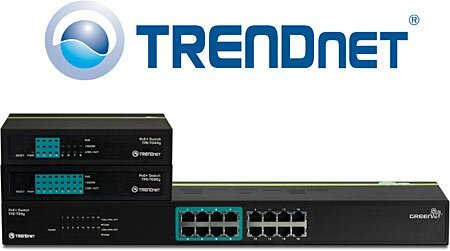 TRENDnet, a best-in-class wired and wireless networking hardware brand, today announces from Computex Taipei, the launch of three new PoE+ switches. Power over Ethernet (PoE) combines power and data over Ethernet cables. PoE facilitates the installation of devices in remote locations, without having to provide an electrical outlet near the device. PoE's popularity is driven by significant installation time and cost savings. The PoE standard is based on the IEEE 802.11af specification. It provides up to 15.4 Watts of power per switch port. The new PoE+ standard doubles the power provided by PoE ports. PoE+ is based on the IEEE 802.11at specification which provides up to 30 Watts of power per port. PoE+ is designed to support power hungry devices such as outdoor access points and pan / tilt / zoom IP cameras. TPE-TG80g features include: eight gigabit PoE+ ports; a 16 Gbps switching capacity; a sturdy metal desktop enclosure; and up to 75% GREENnet power savings. TPE-T88g features include: eight Ethernet PoE+ ports; eight Ethernet (non-PoE) ports; a 3.2 Gbps switching capacity; a sturdy metal rack mountable enclosure; and up to 40% GREENnet power savings.